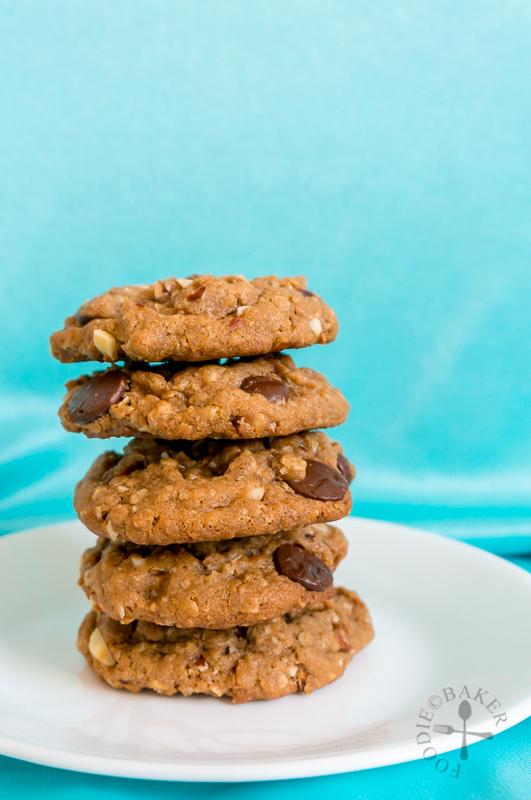 I wanted to use up some leftover peanut butter so I went to Google for help and it returned me with these peanut butter and oatmeal cookies, which looked too delicious not to try! 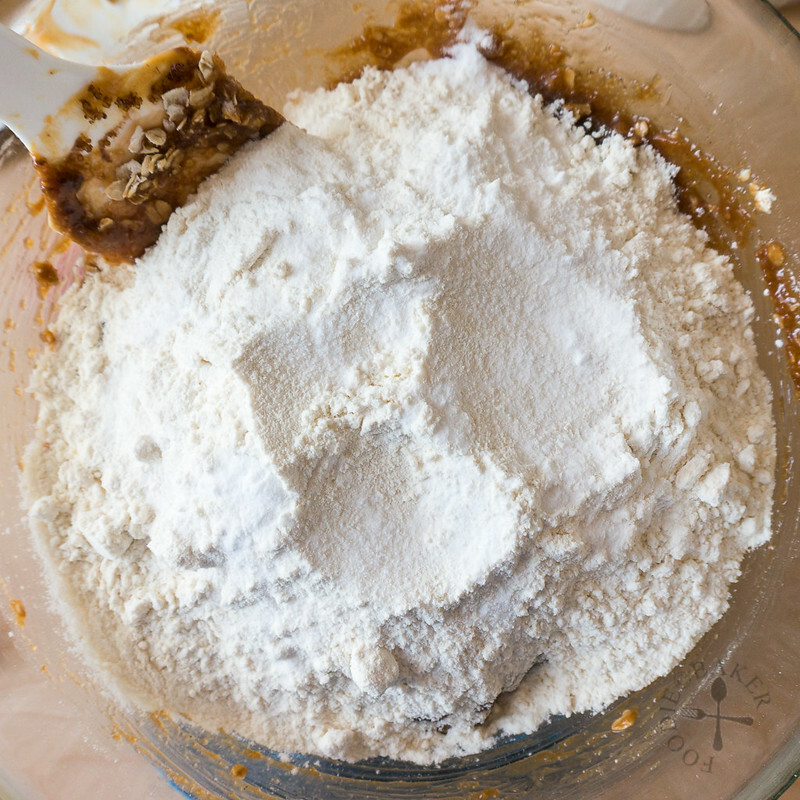 As I emptied the peanut butter into the mixing bowl, I realised I didn’t have enough peanut butter to make up 1 cup! Being too lazy to go out and grab more peanut butter, I simply topped it up with Nutella. I thought there would be Nutella taste in the cookie but it was still overpowered by peanut butter. 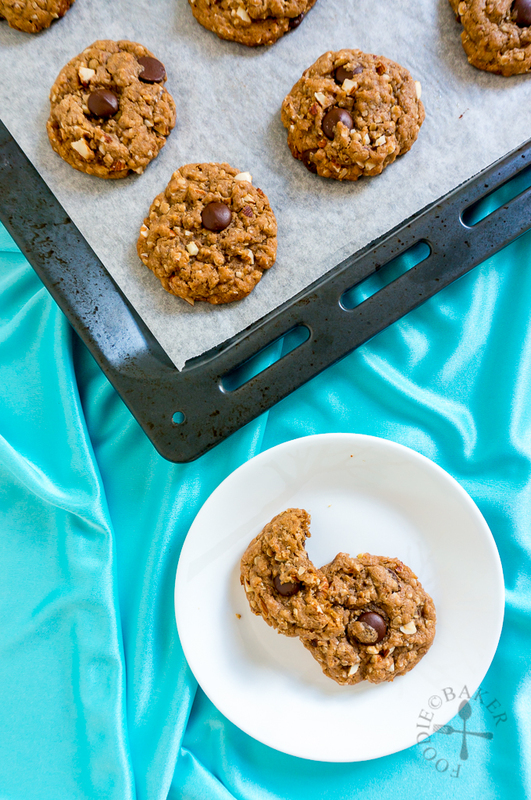 Nevertheless, this is still a very delicious cookie – as I baked them a little longer, it’s crisp on the outside but still chewy on the inside, just the way I love my cookies! 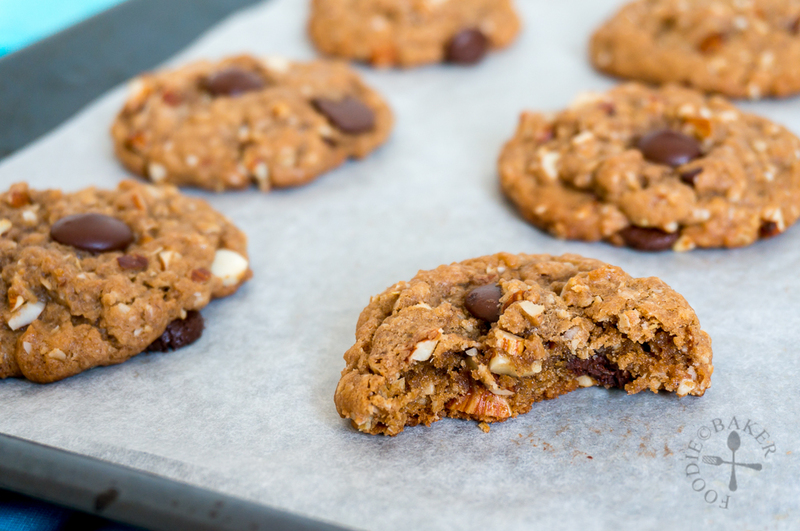 The chopped almonds (supposed to be peanuts but none on hand) and the oozy chocolate chips provide additional textures – crunchy and oozy… how can one resist them!? 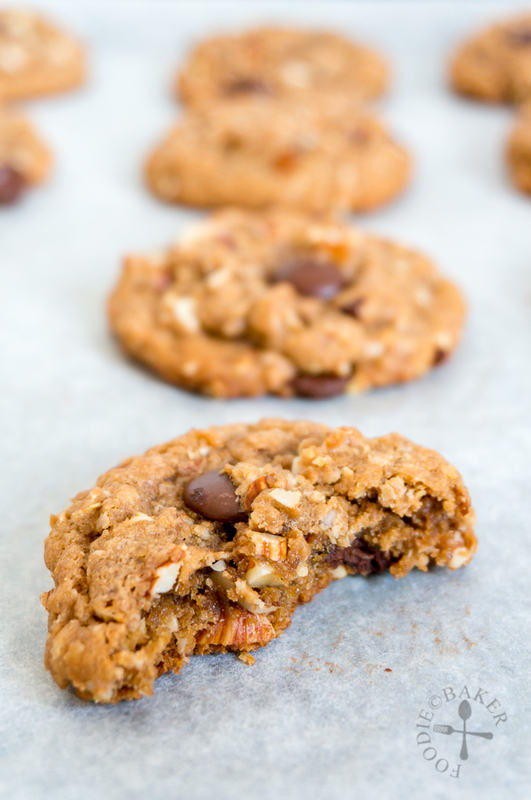 So bake these extremely addictive cookies today! 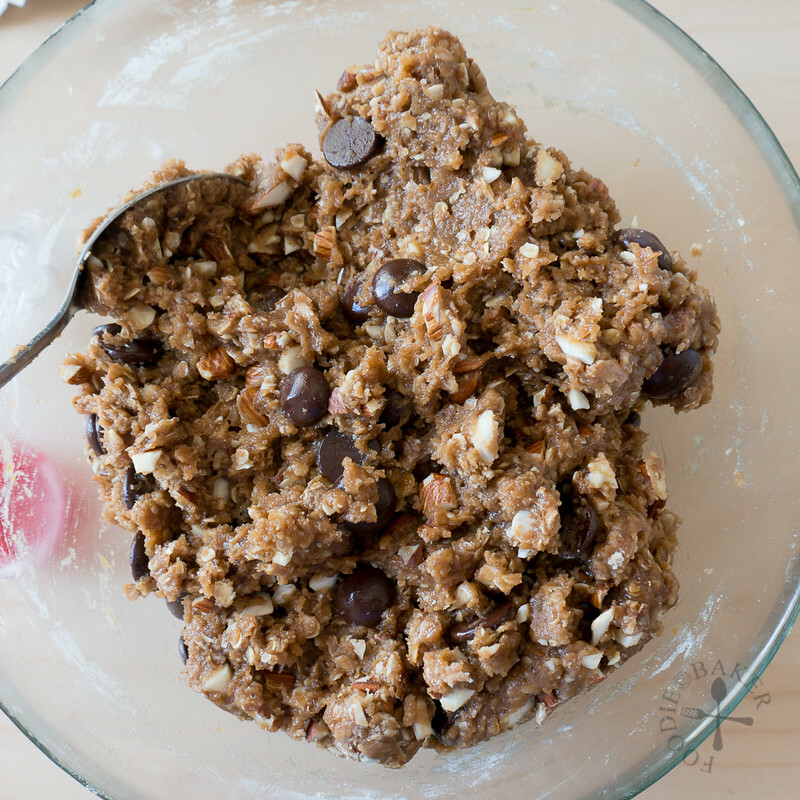 1) Combine butter and peanut butter (and Nutella if you don't have enough peanut butter at home) into a heatproof mixing bowl. 2) Heat the mixture over a pot of simmering water or in a microwave until everything is melted and smooth. Let cool for 15 minutes. 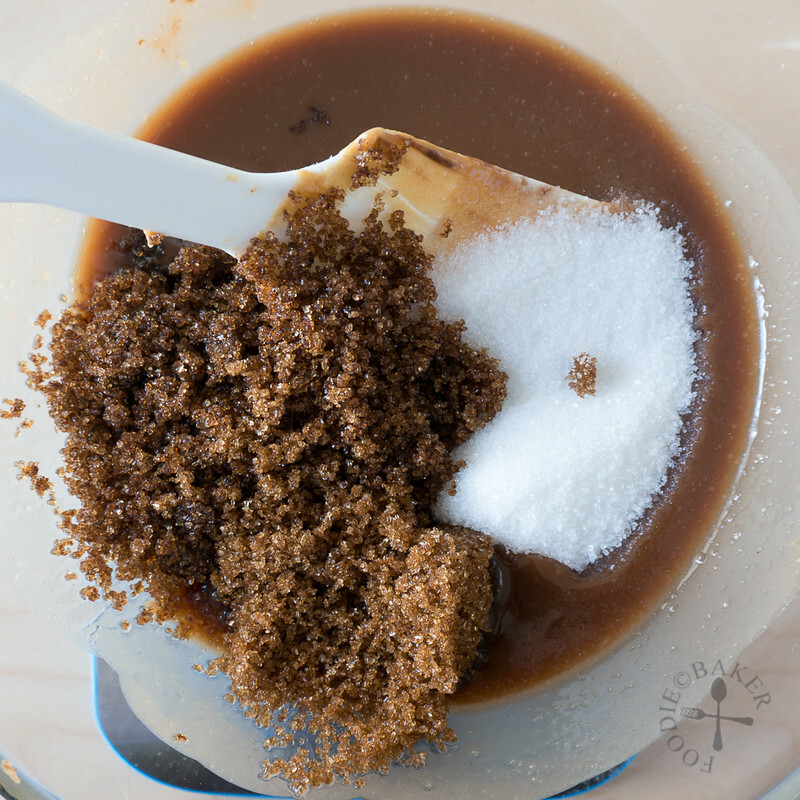 3) Stir in the sugar. 4) And an egg and some vanilla. 5) Followed by oatmeal. 6) And then the flour, cornstarch, baking soda and salt. 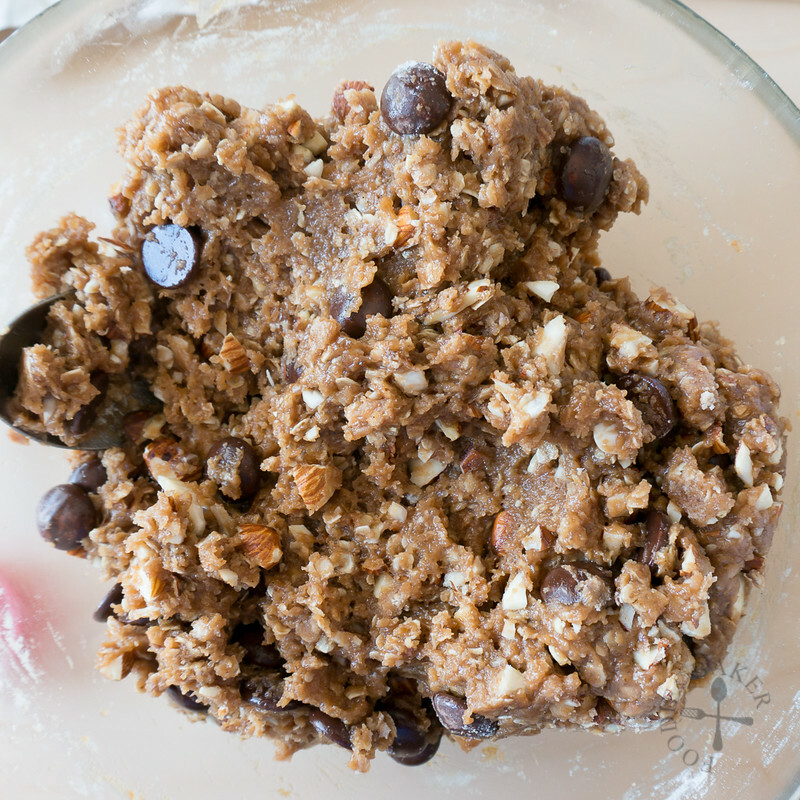 7) Don't forget the chocolate chips and chopped nuts! 8) Mix them altogether. Chill in the refrigerator for at least 1 hour. 9) Here is the chilled dough! 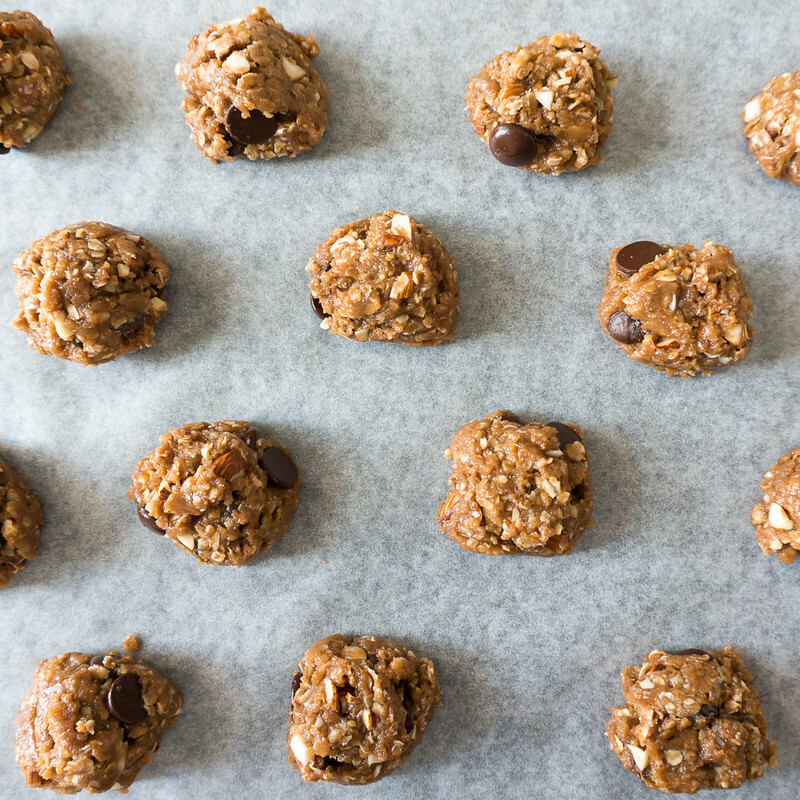 10) Scoop the cookie dough into balls and space them apart on a lined baking sheet. Now they can be baked! 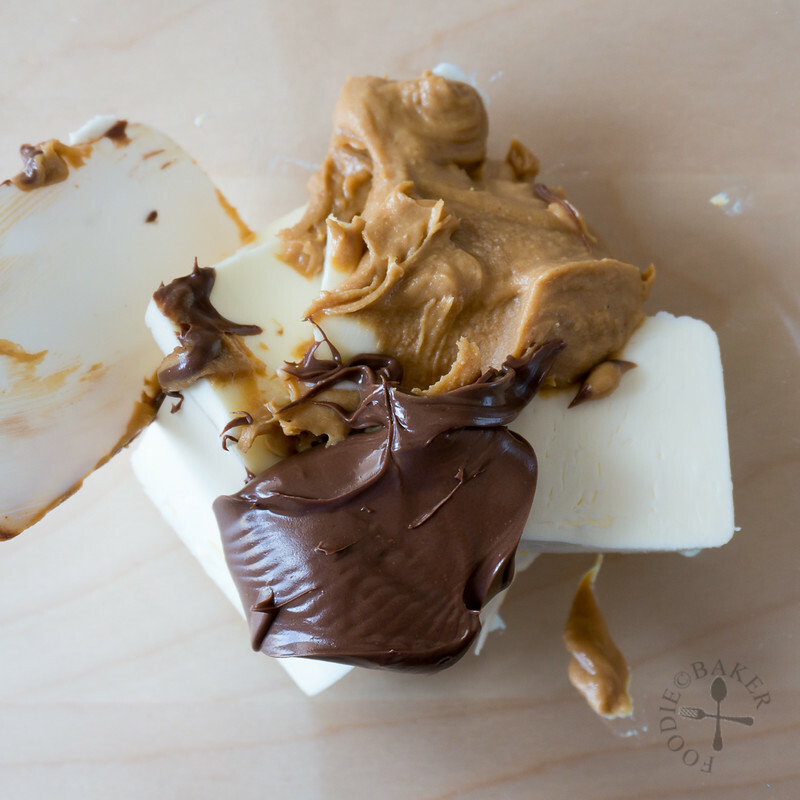 Place butter and peanut butter in a heatproof bowl. 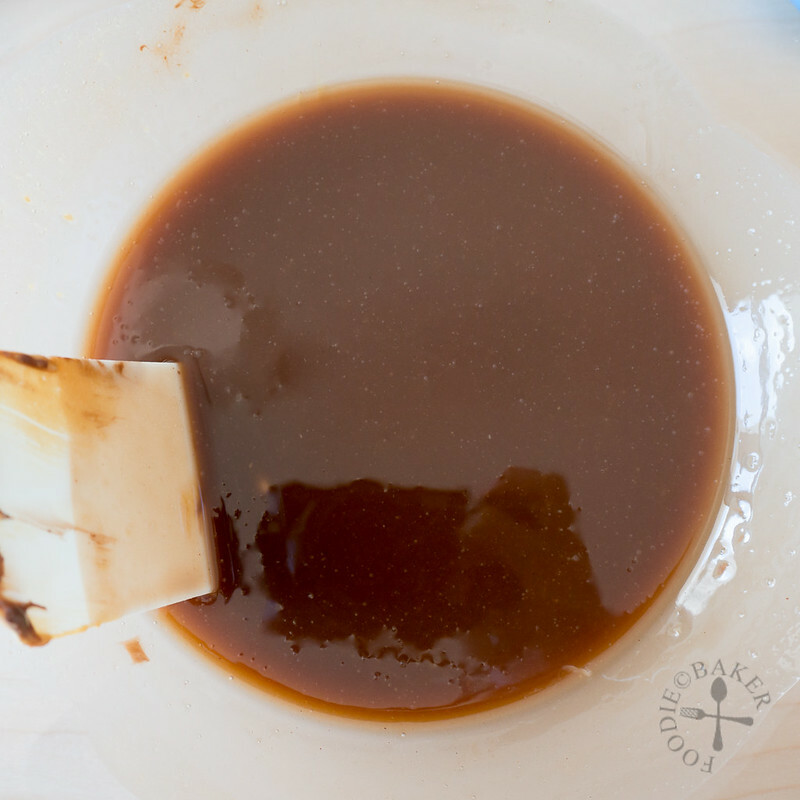 Place the bowl over a pot of simmering water and heat until the butter and peanut butter has melted and the mixture is smooth. Alternatively, you can use the microwave to melt the mixture. Remove from heat and let cool for 15 minutes, stirring occasionally. 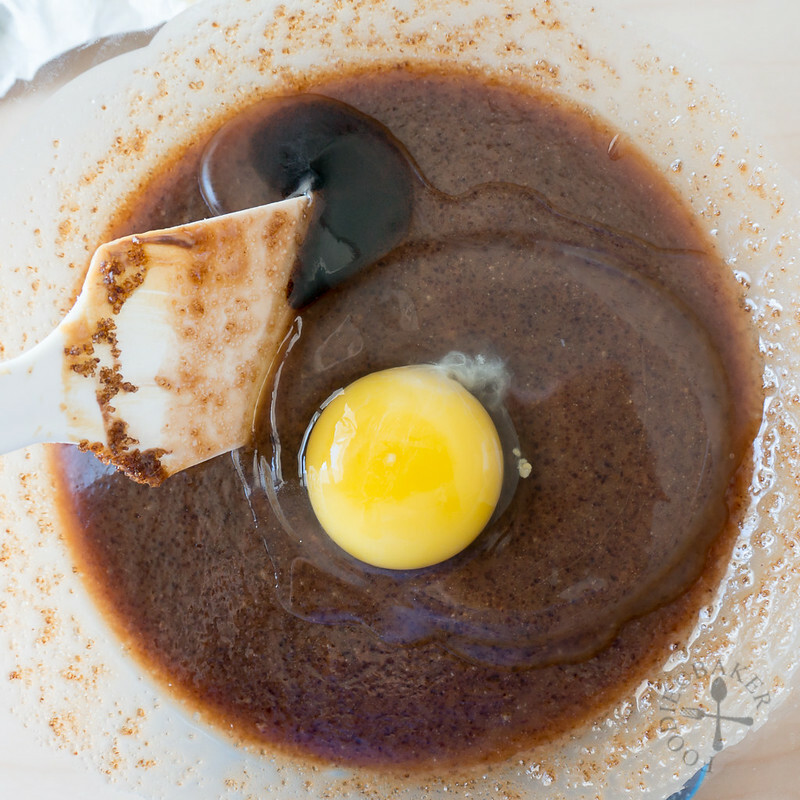 Stir in the brown sugar into the mixture, followed by egg and vanilla. 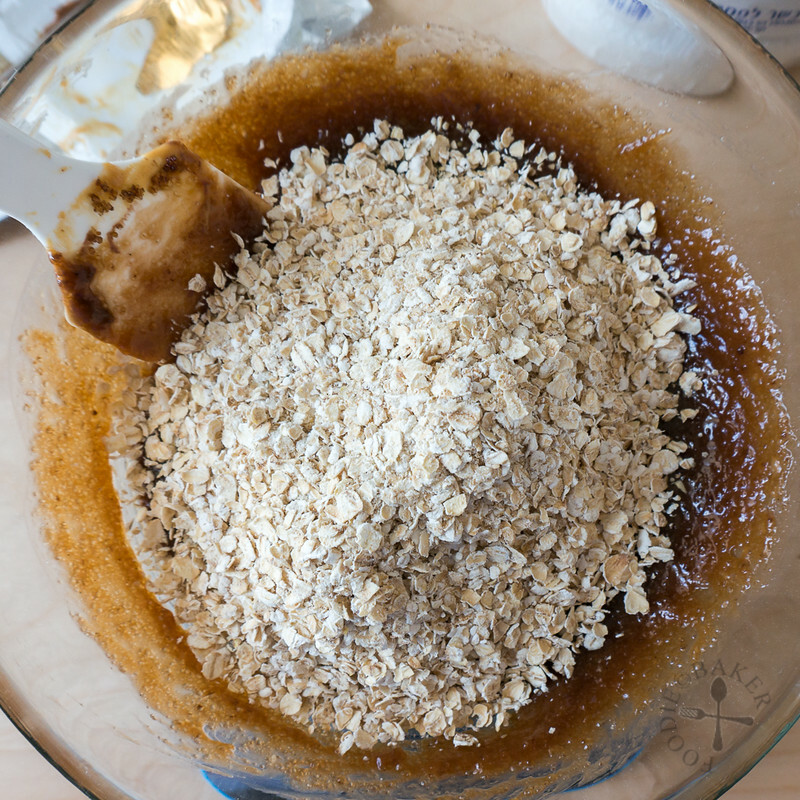 Stir in oats, flour, cornstarch, baking soda and salt until everything is just combined. 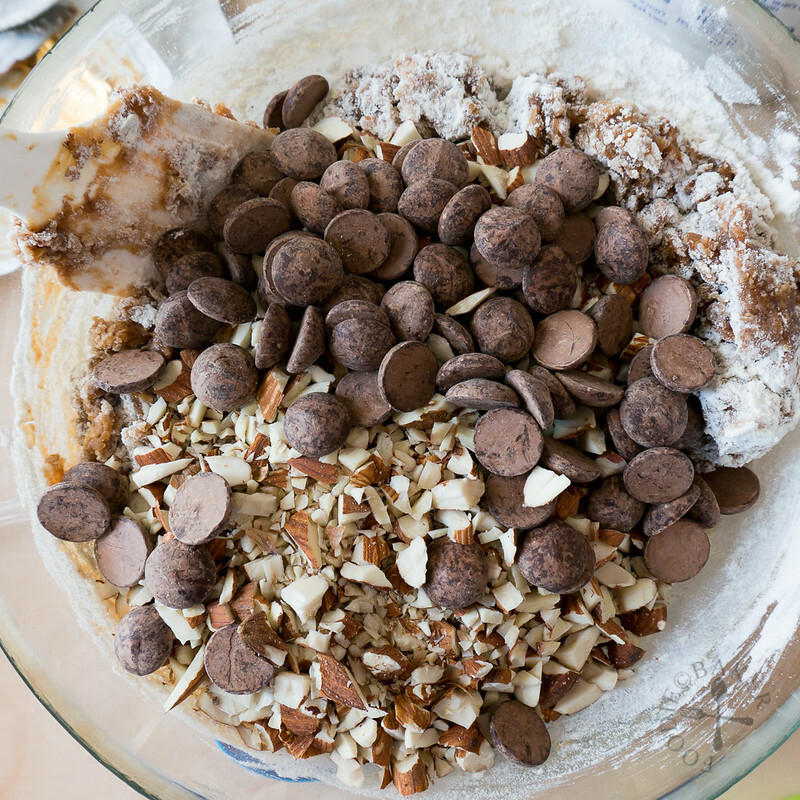 Stir in the chocolate chips and almond. 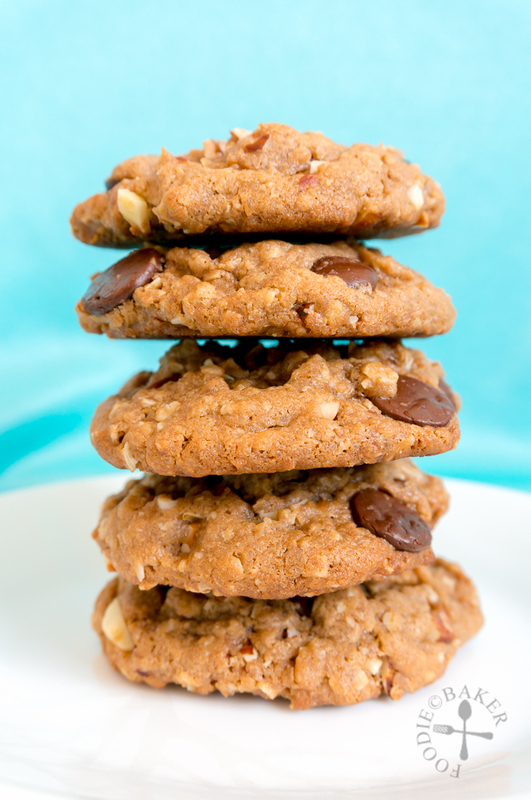 Chill the cookies in the refrigerator for at least 1 hour. Line a baking sheet with baking parchment. Scoop tablespoonfuls of dough onto the baking sheet, spacing them 1.5-inches apart. At this point , you can also freeze the cookies for another day - freeze for at least 4 hours or until solid, transfer the cookies into a ziploc bag and keep frozen until needed. Preheat oven to 175C / 350F. - To toast the almond: Toast the almond in 175C / 350F oven for 15 minutes. All of my favorite things in one cookie 🙂 They look delicious, Jasline!